WESTERN CIVILIZATION, International Edition, is distinguished for its wider definition of Europe that includes Eastern Europe, Scandinavia, and European frontiers. Recognizing that factors outside the continent affected European history, the authors highlight Europe's place in the world throughout the narrative and in the primary source feature, "The Global Record." 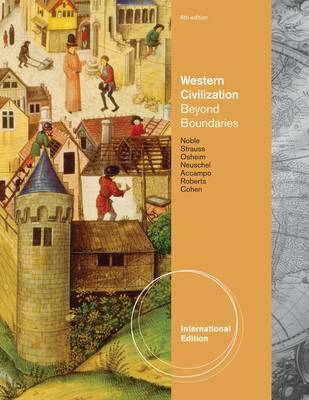 Carefully revised and edited for greater accessibility, the Sixth Edition is briefer and incorporates pedagogical features such as focus questions, key terms, and section summaries to better support students of western civilization. The reconceived narrative and streamlined organization, featuring smaller, more cohesive learning units, lend to greater ease of use for both students and instructors. Available in the following split options: WESTERN CIVILIZATION Complete (Chapters 1-30), ISBN: 0495897906; Volume I: To 1715 (Chapters 1-17), ISBN: 0495897922; Volume II: Since 1560 (Chapters 15-30), ISBN: 0495897930.